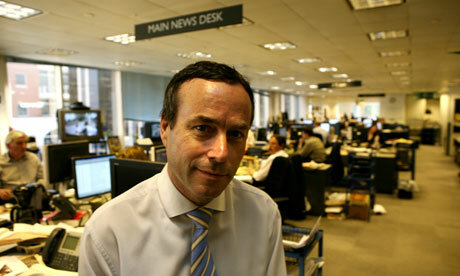 Lionel Barber, editor of the Financial Times. Photograph: Graham Turner for the Guardian. The Financial Times editor, Lionel Barber, has announced plans to move the title to a digital-first strategy in a move he described as a “big cultural shift” for the business daily, and cut 35 jobs. Barber said the FT will make a net headcount reduction of 25 – after hiring 10 journalists for digital roles – in an effort to save £1.6m this year as part of the strategy, outlined to staff in a memo on Monday, seen by MediaGuardian. He added that the FT needed to be “reshaped for the digital age”. He added the FT would only survive if it adapts to the demands of readers in digital and in print. Technology companies such as Google, LinkedIn and Twitter are routinely disrupting the business models of old titles. “It would be reckless for us to stand still. Of course, we must stick to the tested practices of good journalism: deep and original reporting based on multiple sources and a sharp eye for the scoop,” Barber said. Barber said his trip to Silicon Valley in September “confirmed the speed of change” in the media, as he detailed eight proposals aimed at shifting the newspaper’s resources from print to digital. what flavor would it be? Banana, I feel.